Located in a historic 22,000 sq. ft. building downtown Galesburg, Burgess Antique Center has room for over 150 vendors. Our unique building adds to your shopping experience, check out the creative use of seed drying racks and an old school reception counter! Burgess Seed Company built our current location in 1913 where it soon became a ‘bee-hive of activity’. Now, over 100 years later, we have brought back the old-time charm and have opened the BURGESS ANTIQUE CENTER. 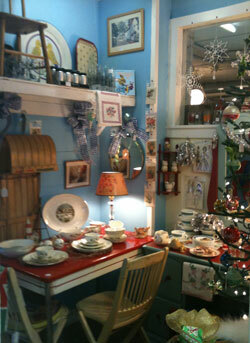 With our huge space and variety of antiques you will surely find something special here. Gift Certificates and Lay-Away options are available. Open 7 days/week, Monday through Saturday 10 A.M.-6 P.M. and Sunday 11 A.M.-6 P.M. We are handicap accessible and have internet based access to sales for our dealers. Easy access on M-96, just one mile north of I-94 at exit 85.